Dress your boiled eggs like Harry Potter! Perfect for hungry Harry Potter fans! We all know that eggs are magic food. But, if you want your breakfast to be truly egg-ceptional – legendary, even – then you need this wonderfully wizarding Harry Potter egg cup and toast cutter! This is no ordinary egg cup – it’s a marvellous piece of Potter-y. The base is Harry’s body (complete with Gryffindor scarf), your boiled egg is his head, and the topper finishes the look with his glasses and hair (because we know that Harry loves a head-wig). 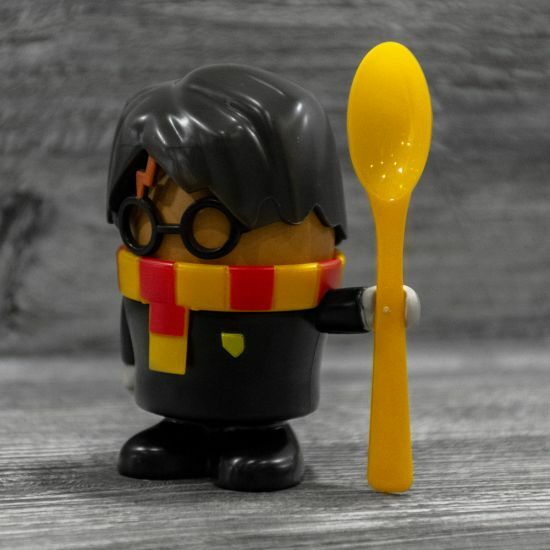 The egg cup also has Harry’s arm outstretched, holding a plastic spoon like it’s a flying broom. And, so that your soldiers can be the toast of the wizarding world, this set comes with a lightning-bolt toast cutter! You shouldn’t walk out the (Gryffin)door without a good breakfast. But, who wants just good? (Not you-know-who, that’s for sure). Point is, to make your breakfasts absolutely magical, get your Harry Potter egg cup set today!